Unsigned but attributed to Mt Washington, ca. 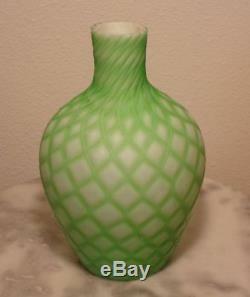 This 7 1/2 tall art glass vase is called Cut Velvet in the Diamond pattern. The color is Green which is a tough color to find this in. It is in perfect used condition with no chips or cracks and no stains or mineral deposit. There are no noticeable scuffs or scratches. This will make a great accessory to any quality art glass colleciton. The item "Mt Washington Green Cut Velvet Art Glass Vase" is in sale since Saturday, April 21, 2018. This item is in the category "Pottery & Glass\Glass\Art Glass\North American\Pairpoint/Mt. The seller is "ainventor" and is located in Gibsonton, Florida. This item can be shipped worldwide.